• You did you best, now remember to let it go. 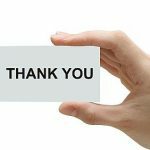 • Always follow-up an interview with a “Thank You” letter within 24-48 hours. • Understand that the interview is just part of the job search process and there may be many subsequent meetings. • Never accept or reject a job until it is offered to you and you have weighed out your options, including their offer package. • Maintain relations with the company via email or mail every other month. They may need you six months or even a year from now. • Do not get upset if you do not get the job. Interviewing always gives you good practice and new contacts in the process. • Do not badger them with phone calls if they have decided to hire another candidate. They get plenty of phone calls from candidates and it can become irritating to get calls all the time from someone they cannot place into a job at the moment. • Use salutations such as, “Best regards” or “Warm regards”. • Always include your contact information. • Be kind, positive and thankful. • Show your relevant interest in the job. • Show your appreciation of the correspondence and interview they provided. • Reiterate your skills or any important information you might have not provided while interviewing. • Remind them about some key highlights that occurred during the interview. • Update them with important information they might have requested. • Convince them as to why you are the solution to their human capital needs. Follow these tips to help create great post-interview acumen. Your contribution to the hiring process never ends directly after the interview. Just make sure to not abuse or overdue it and to be respective towards the company.